When Professor X decides to enter into the great American dream of home ownership, he, in possession of a MFA, turns to part-time work as an adjunct professor at two community colleges to help make ends meet. What he discovers about the system causes him to seriously question the notion of college for all. Professor X laments the lack of preparedness of his students and describes an epidemic of failing grades, as he is caught between trying to help students learn how to write and upholding the academic standards of his employers. The author describes the juxtaposition of five factors that he asserts either participate in the system, perpetuate the preponderance of students flocking to America’s public colleges and universities, or some combination of both: adjuncts, colleges, students, industry, and President Obama and other policymakers. Professor X describes a system of higher education in which many students graduate with enormous debt, only to obtain degrees for jobs that he believes don’t truly require them in the first place. 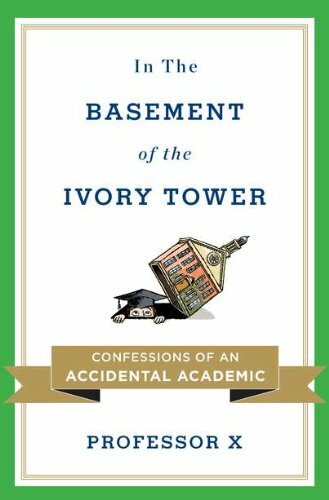 In the Basement of the Ivory Tower makes some good points and is relevant in that after years of shining the light on the perceived faults of K–12 public education in America, the country is beginning to more closely scrutinize higher education. It is not the colleges’ faults that students come to them unprepared, yet they accept these students, try to educate them, and gladly take their money. Professor X asserts that not only do these students not belong in college, but that the pursuit itself is unnecessary in the first place. This premise goes against the American democratic tradition of opportunity for all, and is thus controversial on its face—however accurate it may be. Along the way, Professor X relates story after story of ill-prepared men and women who put forth varying degrees of effort and show disparate levels of interest. He discusses his attempts to help them learn to write and his continuing frustration that most never do. While he doesn’t blame the student, it is questionable whether or not he actually cares; and this is problematic. A teacher who doesn’t necessarily want his students to succeed and accepts the eventuality of their failure should get out of the profession. The book is interesting at times, but has its flaws. The author’s style varies between memoir and commentary, and the book would have been strengthened with more stories of his efforts to reach the students and their trials and tribulations—or at least would have been a better read if it could have more clearly chosen one approach or the other. While trying to be both, it falls a little short in each. Dave Moyer is the author of the novel Life and Life Only and several published shorter works. The former college baseball coach is currently a superintendent in a Southeast Wisconsin school district and a faculty member for Aurora University.